조선 후기 황해도(黃海道) 지역의 군현 지도를 모은 지도첩으로, 18세기 중엽에 비변사(備邊司)에서 제작한 것으로 보인다. 총 3책으로 구성되어 있고, 채색 필사본이다. 정확한 제작 시기는 알 수 없으나, 1719년(숙종 45)에 수군절도사령(水軍節度使營)으로 승격 된 소강진(所江鎭)이 ‘행영(行營)’으로 표시되어 있는 것을 볼 때 1719년 이후에 제작된 것으로 추정된다. 본 지도첩에는 황해도 내 20개 군현의 지도와「황해도전도」가 수록되어 있는데, 문화·신천·안악 등 3개 군현의 지도는 누락되어 있다. 그리고 제3책의「배천지도」뒷부분에 ‘비변사(備邊司)’ 도장이 찍혀 있어서 비변사에서 소장·사용하던 지도였음을 알 수 있다. 「황해도전도」를 제외한 20개의 군현 지도는 방안지(方眼紙)에 그려져 있다. 지도의 표기 방법을 보면, 도로를 적색·청색·황색으로 구분하여 대로·중로·소로를 나타냈으며, 봉수로는 가는 적선(赤線)으로 표시하였다. 지도 안에 산천·면명(面名)·교량·서원·창고·사찰 등을 그려 넣었고, 지도 여백의 주기(註記)에는 민호(民戶)·전결(田結)·세곡(稅穀)·면리(面里) 등의 기초 정보가 표시되어 있다. Bound in three albums, these are hand-drawn colored maps of the Haeseo region, another name for Hwanghae-do Province. There were 20 counties in Hwanghae-do at the time, but maps of the three counties of Munhwa, Sincheon, and Anak are not found. The seal of the Border Defense Council on the back of the Map of Baecheon in the third volume suggests the maps were kept and used at the Joseon Dynasty agency responsible for frontline security. On the maps, the roads are divided into three levels, big, mid-size and small, and are marked in red, blue and yellow, respectively. Beacon roads are marked in thin red lines. Mountains, waterways, towns, bridges, Confucian academies, storages and Buddhist temples are drawn in simple pictorial images. The inscriptions in the empty spaces at top offer basic administrative information like the number of households, taxes levied on farmland, grain levies, and towns and villages. 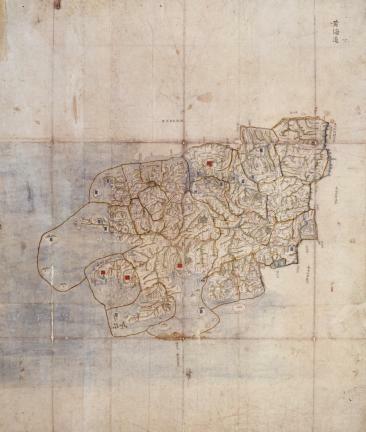 It is not known exactly when these maps were produced, but in view of the presence of Sogangjin Fort, which had been a garrison before it was promoted to a command under the provincial navy commander in 1719 (the 45th year of King Sukjong’s reign), they are assumed to have been made later than that. The maps were produced by the Border Defense Council for regional administrative and military uses and have high historical and academic value.